The whole collection of the War Illustrated is available as PDF downloads here. Interesting insights into contemporary, albeit with a massive propagandistic slant, views during WW2. Enjoy! Something was definitely up at Ponape. 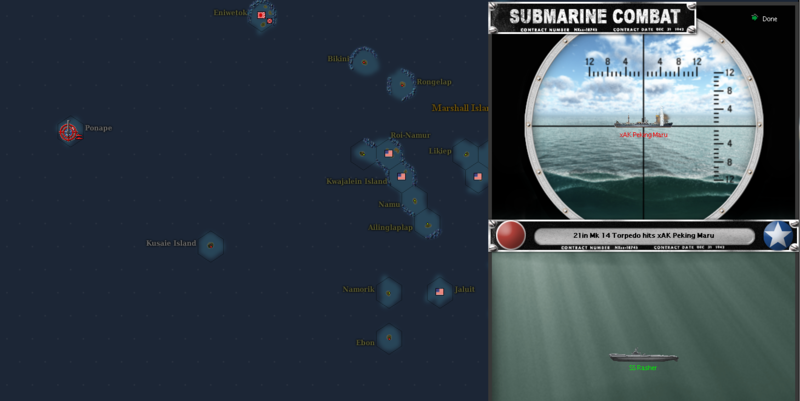 SS Rasher reported that she had torpedoed a transport in the anchorage near the atoll. Her skipper also included the sighting of many other ships in his report. He was given immediate orders to shadow the enemy convoy at Ponape and to attack any targets of opportunity that arose. These orders were later rescinded and the Rasher was immediately ordered to a position to the South West of Ponape where enemy aircraft carriers had been spotted. The source of those Zeroes yesterday had been found and the Rasher along with a brace of other submarines were to shadow and attack the enemy carriers. 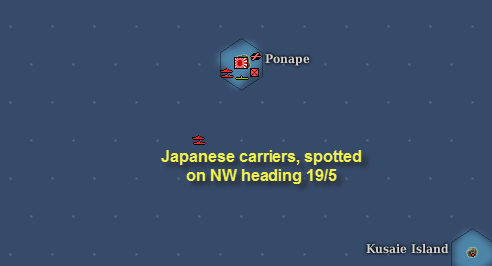 A quartet of Fletcher Class destroyers were also making a high speed approach of Ponape in order to get at the task force unloading there, unfortunately they arrived too late as their nocturnal sweep brought no returns to their radar screens. With enemy carriers pinpointed at close range they got out of Dodge fairly rapidly and headed back to base. Post haste. Sun up on the 19th May found Ponape anchorage empty but recon photos clearly showed many vehicle tracks leading from the beach to the tree line, a clear indication that the Japs had reinforced Ponape. An opportunity had been missed by the Fletcher’s! 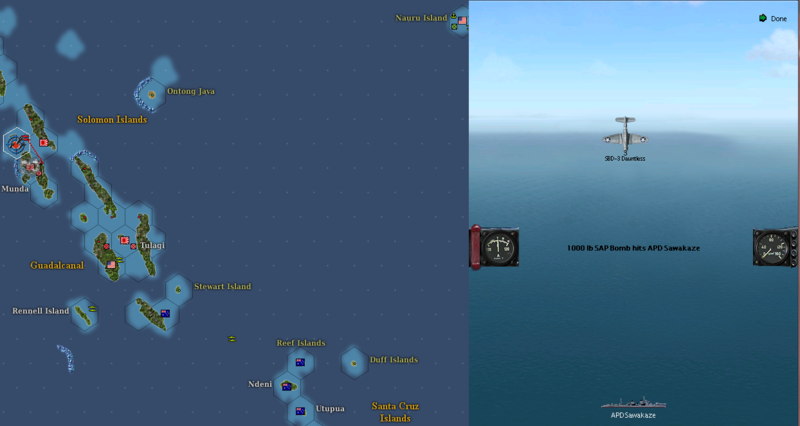 The enemy carriers were once again found by VP-14, this time steaming solidly North West, Truk mayhaps? Owning the 8 volume of the Kreigstagbuch der OKW I have started to download the IGS equivalents: The Weekly Resumes available from the National Archives (link) as free PDF’s. Interesting reading the events from opposite sides. Ill attach a sample resume for your perusal if you are interested. 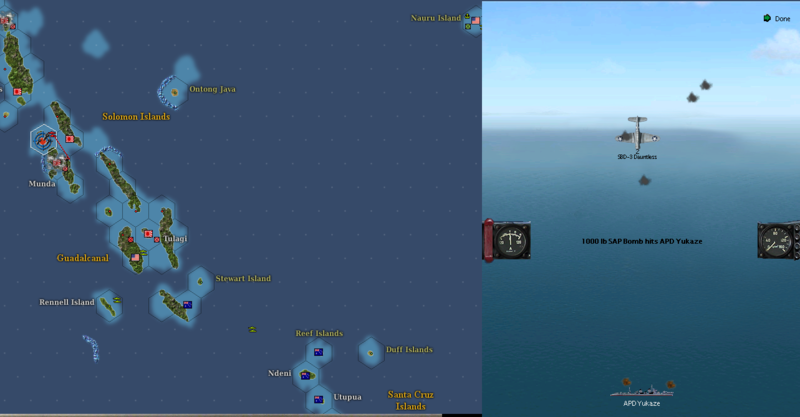 Operation Flanker has commenced with the landings on Tulagi by the 27th Infantry Regiment supported by the 112th Cavalry Regiment and the occupation of Rossel Island by an Australian commando unit transported by submarine to its target. This latter operation went off without a hitch as Rossel Island was unoccupied by the Japanese. The landings on Tulagi were another matter altogether. Though isolated for all intents and purposes since the fall of Lunga the Japanese still held this small island off Guadalcanal. Once aerial superiority had been achieved over the Souther Solomons the idea was to mop up and consolidate the position before moving on. 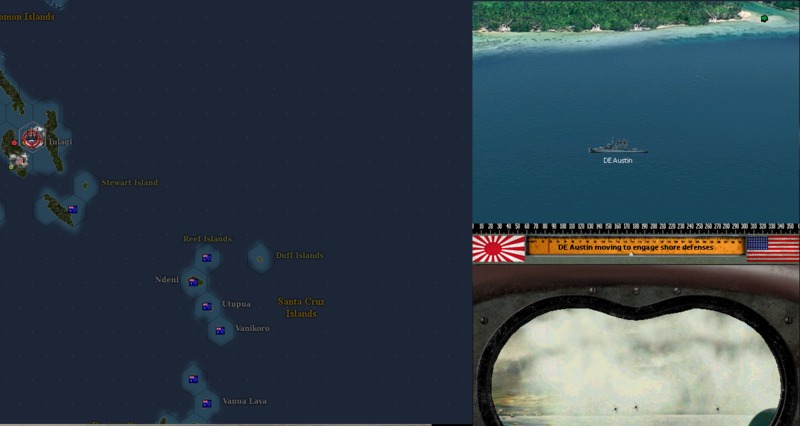 Small surface action forces were attached to support the operation and Tulagi was bombarded by a brace of destroyers. It was estimated that a small sized, maybe of upto battalion strength, Naval Guard unit made up the garrison on Tulagi. Both amphibious task forces approached Tualgi without a hitch and as the small boats ferried the troops ashore, guns mounted on the attack transports shelled the Japanese troops that were responding with light and sporadic machine gun and mortar fire. Both US Army units were relatively green and the Tulagi operation would be a good blooding for what is surely to come further North. Substantial aerial support has also supported the operation. From mediums in the Santa Cruz Islands to the heavies further south. However it was the Avengers of VT-37 of the USS Sangamon. Fully repaired from its torpedo strike off Kwajalein the other month the Sangamon was acting as flag ship for the operation. It fighter component (VF-37 flying the F4F-4) maintained close CAP sorties. Army close support aircraft in the form of A-24’s of the 8th Bomber Squadron also flew their first combat missions after being in the theatre for almost 12 months now! Despite suffering from severe disruption upon hitting the beaches both units were set safely ashore and looking to consolidate their beachead over night with a view to launch an attack on the morrow. The Japanese did not show themselves other than a small mortar attack that hit the 112th Cavalry’s landing zone causing no real damage. As a matter of fact several 105mm howitzers of the 27th Infantry were able to conduct counter battery fire onto Japanese positions beyond the tree line, such are the benefits of aerial supremacy! Further to the North two Catalina’s of VP-14 brought back news that was later confirmed by B-17’s attacking Ponape. 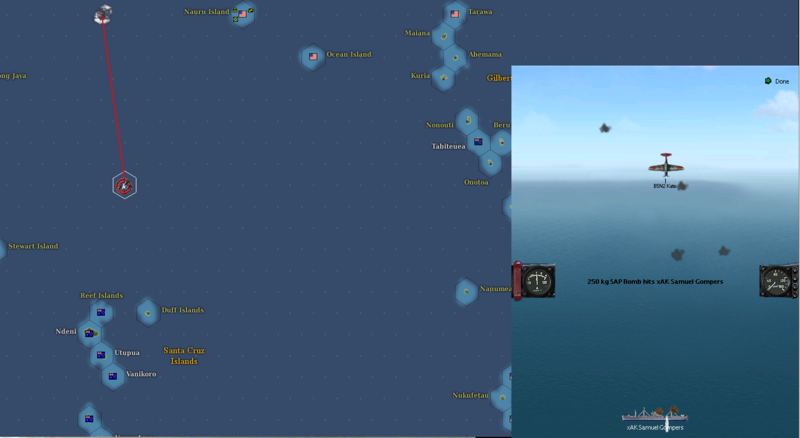 A cluster of enemy carriers and battlewagons had been spotted by VP-14 some 500 miles to the North of Onotong Java. Indeed one of the Catalina’s failed to return to base, its last garbled message indicates that it was shot down over the enemy ships. 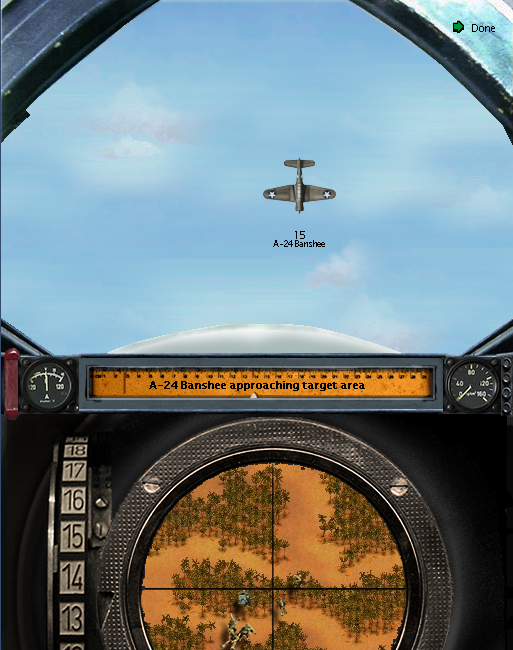 The presence of enemy carriers was also confirmed by B-17s of the 98th Bomber Squadron that reported being attacked by A6M2’s over Ponape, hitherto a milk run of a mission. The enemy fighters were seen to be carrying the markings prviously seen on the squadrons belonging to the Soryu, the Hiryu and the Zuikaku. Fuf! What a nervy performance by United, is squeaky bum time affecting the players? United were lethargic, nervy and very pedestrian. Old Trafford sounded more like a morgue than a football stadium and 25 minutes in David De Gea had already made two saves while Schwartzer in the Fulham goal still had cold palms! We lacked punch and are passing was sloppy to say the least. Considering Sir Alex Ferguson had already mentioned that goal difference was bound to be a factor on reckoning day our attack was feeble to say the list. Welbeck had something of a mare while Rooney, largely anonymous until his goal, seemed to be late to all passes. Antonio Valencia once again proved he is United’s, and probably the League’s form player but tonight his final ball let him down. Credit to Fulham, however, who maintained form and shape through out and moved the ball around elegantly kept themselves in the game until the final whistle and were denied a very plausible penalty by the referee. United’s slow tempo and lack of quality in the pass meant the match was dour and boring for many stretches of play. United’s goal game from a long Young cross which Evans bravely won and nodded back across the area to find Rooney with his gun cocked and loaded. A sharp pull of the trigger and United were one up. Rio Ferdinand limped off in the second half but with one whole week to go before our next game he should be fit for our trip to Ewood Park next Monday. Most important thing were the three valuable points that take us back to the top of the league. Long has it been said that the mark of champions is to win games like these in which you play like crap but still remain victorious. Admiral Nimitz was not a happy man. 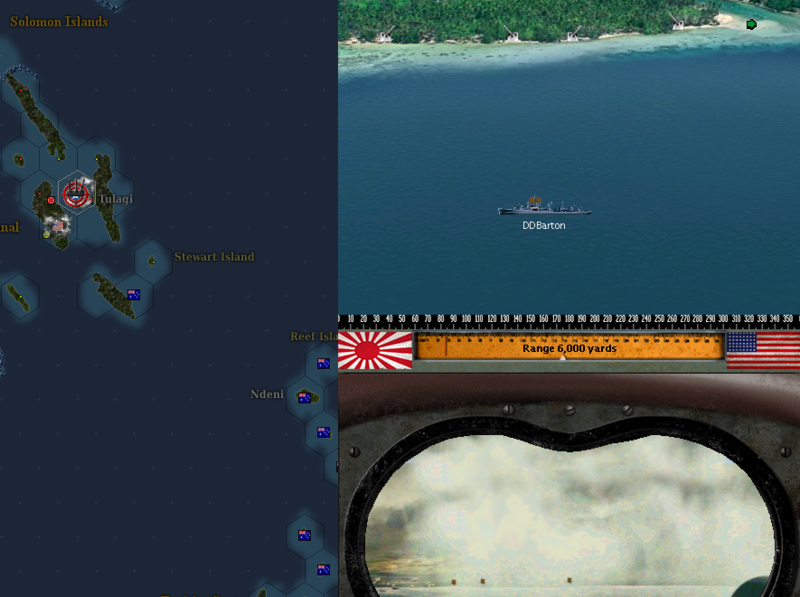 The source of his melancholy was the sudden reappearance of Japanese carrier forces to the north of Nauru Island. Unexpectedly they had launched an attack on the small forward base there. Heavy damage was sustained by the air strip but credit has to be given to the P-39’s of the 70th Fighter Squadron that put up a spirited defence against the Zero swarm. Luckily enough only three planes were destroyed on the ground, the nine pilots the 70th lost today gave their lives to protect the bombers on the ground. Nimitz was livid. The lull that had fallen over the Southern Solomons had lured the USN into a false sense of security and now a substantial Japanese carrier force lay poised on its flank. Livid was perhaps too nice a word, he was well and truly pissed! It was also interesting to note that a new type of carrier borne bomber had been identified in the attack on Nauru. Marine Bomber Squadron 231 today carried out the first bombing raid from the air strips at Lunga. Having conquered Lunga Point, then weathered the storm of aerial and naval bombardment, US Army and USMC units have been establish a strong position on the southern half of Guadalcanal. Fighters from Lunga had already carried out sweep missions over Munda but today saw a new twist in the Solomons Campaign. SBD-3’s spotted and engaged a Japanese fast transport Task Force at Vella Lavella. 18 SBD-3’s were escorted by several F4F-4 fighters as they sped north. Three enemy ships were seen docked at Vella Lavella, seemingly taking troops aboard. The squadron divided into four, four plane vics and they all followed the brace of Dauntlesses that led the dive down from 12,000 feet. They screamed down as their escorting fighters circeld above keeping a watchful eye for any A6M3’s that were operating in the vicinity of Shortlands and Buka. The first two bombers scored near misses on a wildly twisting and turning APD. It avoided the first two bombs but its luck run out soon after. It took three consecutive direct hits that saw it split in two and sink beneath the waves in record time!